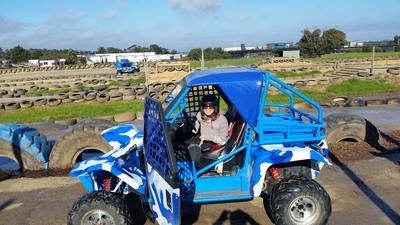 Adventure enthusiasts get yourselves down to Heatherton for an off-road driving experience you and your kids are going to love. In what is named "Australia's Wildest Driving Experience", Wild Buggy is a muddy track filled with bumps, jumps, bridges, wooden logs, rocks and tyres. Jump on board your very own vehicle and take to the track with your instructor for a fun-filled adrenaline ride in the 'burbs! Usually such adventures would be reserved for the grown-ups, but not this time. Wild Buggy's minimum age for drivers is just 5 years old. Yes that's right folks, your kids can enjoy a ride of their very own (albeit with a qualified instructor by their side). The KidTown Melbourne crew took the track on Saturday and had the BEST time. 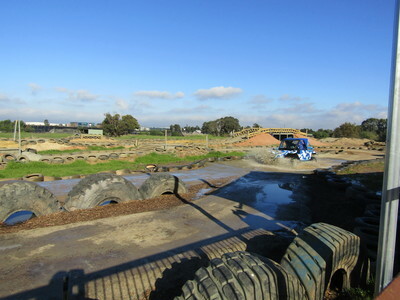 Wild Buggy adventures are booked in blocks of 10, 15 or 20 minute drives, each priced differently. 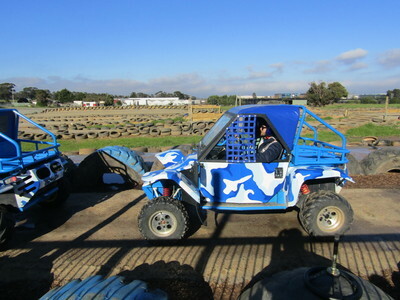 If you don't hold a driving licence, much like KidTown Mr.8, you still have a go but you'll be co-driving in a dual control buggy, sitting in the passenger seat with a trained instructor. Mr.8 took to the wheel, which pleased him no end! After completing a disclaimer form and watching a brief instructional video, our instructors helped us choose the right sized helmets to wear (over the top of lovely blue hair nets for hygiene purposes!) and we were ready to rumble. Mr. 8 and KidTown Dad went first while Mr.3 and I watched on. They both took to the track for 20 minutes; a decent amount of time to get used to the vehicle and circuit. By the final few rounds they were flying! Mr.8's squeals of delight could be heard a kilometre away, particularly through the water puddles and flying down the bridge. I must be honest with you, I got quite nervous before jumping into the driver's seat myself. I'm not the most confident of drivers at the best of times. After the first few rounds all my fears were thrown out the open window, and by the last run I even managed to get airborne over jumps - go me. I wasn't particularly good at hitting the breaks at the right time, but it didn't matter because the instructor took care of that so I didn't crash! Buggy's don't have power steering, and I'd say that's the trickiest part, but it's so much fun. I'd do it again and I know for sure the rest of the KidTown crew will. 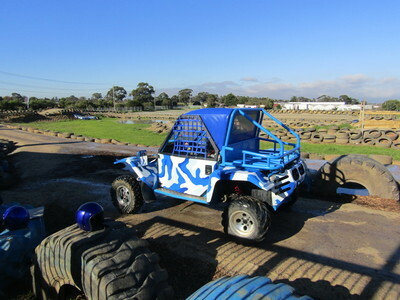 Wild Buggy's instructors are passionate about what they do and very friendly. We felt comfortable and safe; useful for the nervous members of the family like me. If your child enjoys their Wild Buggy experience, consider booking in an adventurous party for his or her next birthday party. Wild Buggy parties start from $32 per child and you have access to a party room. Costs: From $29 (child), $55 (adult).